Hang Tags come with huge potential as a marketing tool. It is creative component which is easy to incorporate into the marketing strategy of a business. Hang Tags are fantastic medium that let you get your message across in a creative and wonderful way and help you stand out from the crowd. Owing to its great potential many people use them as business cards, coupons or price tags. These can be an intricate piece of your marketing campaign which is sure to draw instant attention. Hang Tags are a great way to promote your brand, market your business and above all set yourself ahead of the rest. The Hang Tags providers out there have loads of options on offer to customize the Hang Tags and make it a unique one. 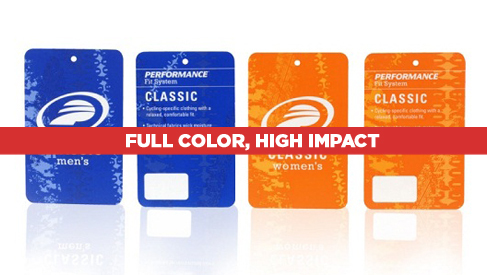 Some most common applications of Hang Tags are Clothing Tags, Price Tags and Branding Retail Products. Today’s Hang Tags are available in full color on 14 pt. Card Stock with UV Coating surface option which is why it is very durable and has a fantastic feel and touch. Although Hang Tags are still an underutilized marketing tool, it can be used to the best to reap huge benefits in the long run. As these are inexpensive and can be attached to just about anything, these tags prove to be the perfect marketing tool for small businesses. But at the same time it can produce the same benefits for larger corporations as well. To make sure that you get the most out of your marketing campaign using Hang Tags, a few key points are there to be kept in mind. The design of the Hang Tag is very important; it should be meant to target your audience. Make a good research and choose a design that your target audience will be responsive to. Make sure that the shape of your Hang Tag is unique stands out from the pack; anything that your business sells can be made into custom shape. Have a unique and action focused effective copy but keep it as short as possible. Try to get as much feedback as you can. Although typically used for clothing, Hang Tags can be used for any product, from toys to food products or anything you can imagine. A proper Tag is a nice combination of colorful artwork, a bit of product information and the name of the company providing. 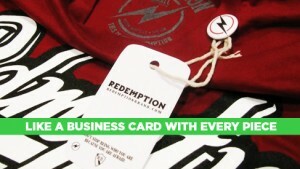 A Hang Tag can make a person turn to that product and even make him or her actually buy it. A perfect hang tag is one which is pleasing to eye yet informative and not too wordy. A striking well designed Hang Tag can change a glace to purchase. This entry was posted in Marketing and tagged Hang Tags on December 17, 2013 by Srinjoy Mallik.